Ikebukuro Tobu is Tokyo’s largest depachika with over 200 food stalls. The depachika is spread out over two floors and two buildings, and is worth a careful peruse. The restaurant floors on the upper five floors of the department store offers tempura, tonkatsu, sushi, unagi, and much more. The restaurant floors are packed on weekends, but a great option for weekdays. The unagi shop, Aji no Miyagawa, grills the fresh water eel and glazes it with a sauce that is not sweet. It is a nice change from the cloying sweet soy that is often found at unagi-ya. The unajū box of rice topped with grilled eel and sauce, but on this day, the lunch set called out to me, including sashimi, and simmered vegetables. The clear soup includes the eel liver. This lunch is about 4,000 JPY. Aji no Miyagawa’s main shop is at Tokyo Station. There are a few branches in the city. Ikebukuro Tobu is Tokyo’s largest depachika. While exploring it recently we came across what is one of Tokyo’s great curry pans, bread filled with curry and deep-fried. This one caught my eye as it is called 豚の角煮カレーパン　buta no kakuni kare-pan, simmered pork belly curry bread. The bread is studded with shards of bread that when deep-fried crisp up like croutons, offering a nice contrast to the tender pork belly inside. The curry is not very spicy, but just a hint of spice. This is definitely one of my favorite curry pan in the city. Pan Rizotta is a bakery inside of Ikebukuro Tobu. This is the only Pan Rizotta in Japan, so the only place you will find this simmered pork belly curry pan. If you are in luck, as we were, the 揚げたて agetate sign will be out indicating it is hot out of the deep-fryer. Tobu can be accessed from Ikebukuro station. Midori Sushi is a sushiya chain, popular both with locals and tourists, that is known for its basement bargain prices. When we query our preschool son to pick what to have for meals out, it is often sushi. 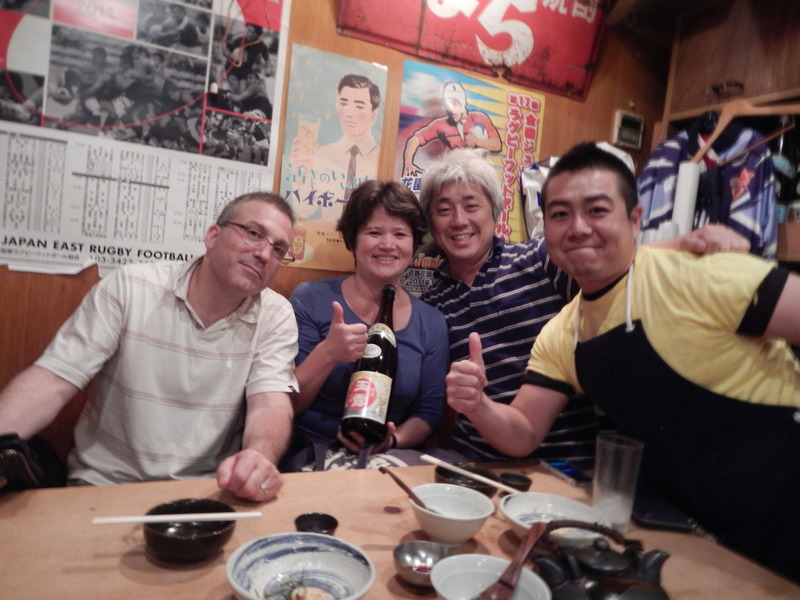 Our go-to place is Choshi Maru which is in our area. Choshi is a famous fishing port in Chiba and the restaurant gets a lot of its seafood directly from the port. But this evening we decided to break from routine and check out Midori Sushi. We arrived before 5:00 p.m. and there was already a line of mostly elderly diners. Yes, it was the retirement crowd. Every time I have passed a Midori Sushi, there is always a line. We waited for about 15 minutes before being seated. One look at the menu and it is apparent why everyone loves coming here, it is very cheap. The question is how is the quality? The chirashi zushi bowl on the left above was only 1,000 JPY ($10 USD). It was made of tuna, katsuo, kanpachi, two types of squid, shrimp, ikura, tamago, anago, and pickles of takuan and gobo. The sushi set on the right was 1,600 JPY ($16 USD) and included ikura, uni, herring roe, and much more. The neta pieces were very big, so it is a full meal. Is this silly? The two of us could have dinner for about $25 and leave full and satisfied. Lunch is even cheaper. The rice is Yamagata haenuki and is nice for sushi. This rice is touted for its nice texture, inherent sweetness, and the fact that even if it is cold it still delicious. This is a key point when it comes to take-away sushi. The branch we went to had a small refrigerator in the front of the shop for sushi-to-go. The prices there were even cheaper than dining in, and at the time we were leaving, many of the sushi packs were discounted by about 30%. So, the quality of the seafood? It was good. The tuna was very nice and the anago seems to be cooked in house was also very good. For the price, it is a great value. If you are traveling in Tokyo and are on a budget, then put this on your radar. If you do not have a budget, then go elsewhere. This chain is kid-friendly if you are traveling with your family. On this Friday evening the suburban restaurant was filled mostly with retirees when we were seated. As we left, it was filling up with families. Service is friendly and there were a lot of seasonal seafood options as well as many small plates built around seafood starting at about 600 JPY. 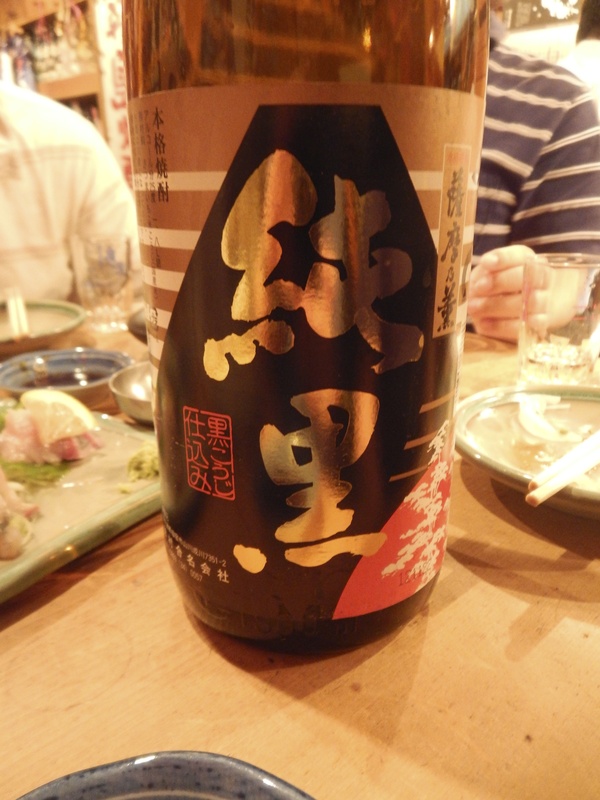 The beverage list includes beer, sake, and shochu. We’ll be back. This may become our new go-to sushiya for meals with our son. As long as we avoid the peak dining hours when the wait could be long. Midori Sushi’s main shop is in Umegaoka in Setagaya-ku is their biggest store. Branches can be found in Ginza, Shibuya, Akasaka, and a standing sushiya in Ikebukuro. Addresses are below in English. Kaijin literally means the God of the Seas, a perfect name for this ramen shop that does not use meat. The seafood soup at Shinjuku Kaijin changes daily based on what seafood is in season. The broth, while rich in flavor, is light and refreshing on the palate. The fish that goes into the broth is written out daily on large white paper that is hung up on the wall. Ara refers to the head, bones, and other scraps of fish that can be either simmered in a sweet soy broth and carefully picked over when eating. Here at Kaijin the chef uses the ara scraps to make the soup stock. Salt is added to the broth. The noodles are thin, which is exactly what this broth needs. It is garnished with julienned leeks, and a chicken and a shrimp dumpling. If you have an allergy, be sure to tell them, ebi no arerugi- ga arimasu. If you have a big appetite, be sure to order the grilled onigiri (rice ball) and put it into the soup when you are done with the noodles. The salty yuzu koshō paste is also a great way to add depth to the ramen. Kaijin also has shellfish ramen, like asari (littleneck clam) or hamaguri (Orient clam). I have tried these, but much prefer the complexity of the seafood ramen, their signature dish. These are the signs in front of the Shinjuku shop. It’s a smaller shop with counter seating for five, a table for four and a table for two. There is often a line going down the stairs, but it usually moves quickly, as this is a quick meal. Be sure not to linger after you’re done eating if there are people waiting. There are three branches in Tokyo at the time this blogpost was written. I have been to the Kichijoji shop, which is close to the station, but the soup was too salty and I won’t go back. The Shinjuku shop is also near the station and where I go. A new shop has also recently opened in Ikebukuro. When going out to izakaya I always take some ヘパリーゼ　Hepalize to prevent a hangover the next morning. Usually in the tablet form. 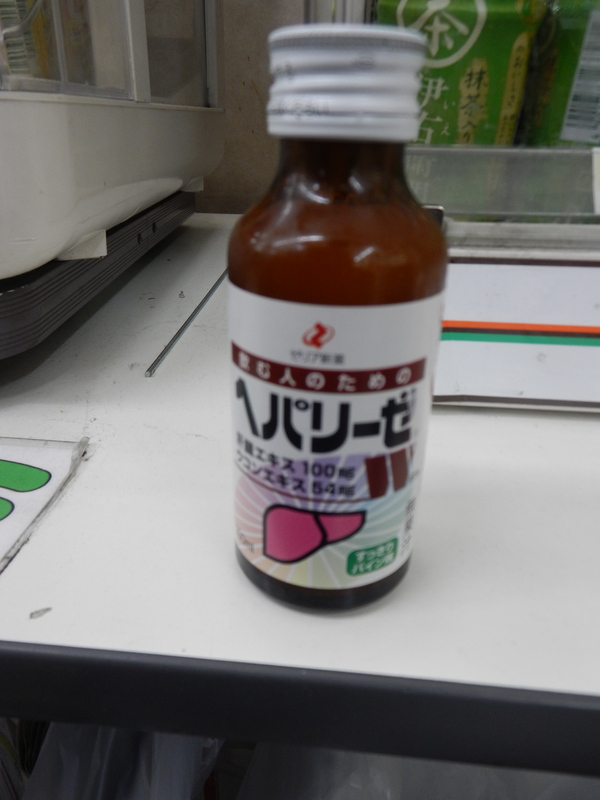 But, today I forgot to bring some Hepalize pills with me from home so stopped by a convenience store and picked up this liquid form. It worked like a charm. We had lots of shōchū, but feeling great the next morning. 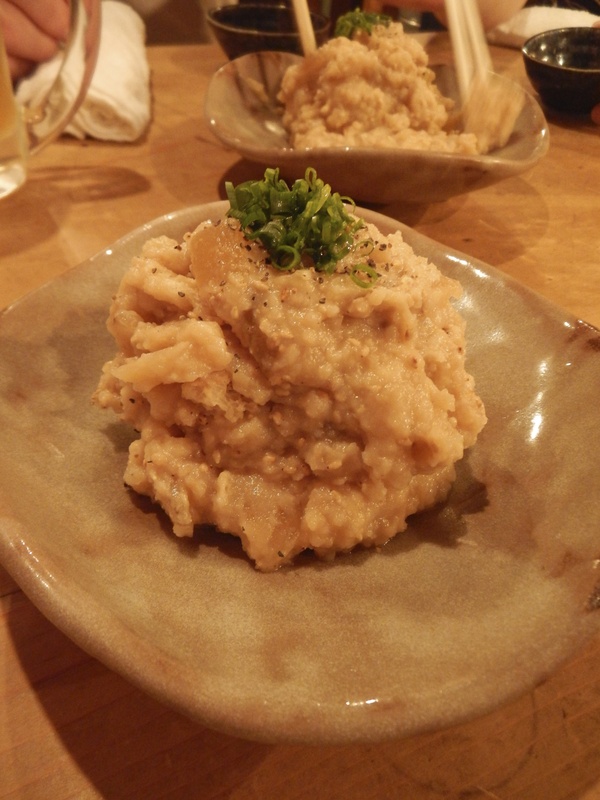 ポテトサラダ　Potato salad is a very popular dish at izakaya. It is often made with copious amounts of mayonnaise, boiled carrots, and sliced ham. But this version was very different. I couldn’t sense any mayonnaise. Instead, it was loosened up with possibly some dash and mixed with some sautéed onions that gave it a bit of sweetness. And, there were crunchy pieces of fried onions, reminding me of the French’s fried onions found on top of the green beans and cream of mushroom dish we often see at Thanksgiving. 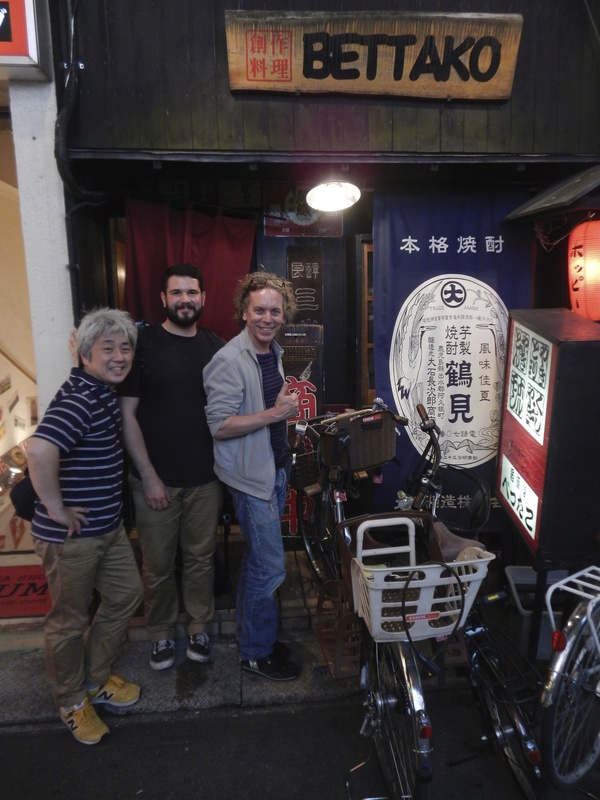 Bettako is an izakaya that specializes in shōchū. Shōchū is the distilled spirit, native to Japan, that is made with a variety of base ingredients. The good stuff, honkaku shōchū, is only distilled once. As a result, it maintains the aroma and flavor of the base ingredient, like sweet potatoes or barley. It is also usually only about 25 degrees in alcohol, and is often watered down, bringing it down to about 15 degrees. So, it’s similar to what you’ll find in a glass of wine. Shōchū is very food friendly, and can be served hot or cold. Bettako is unique that most of the shōchū here is served maewari. 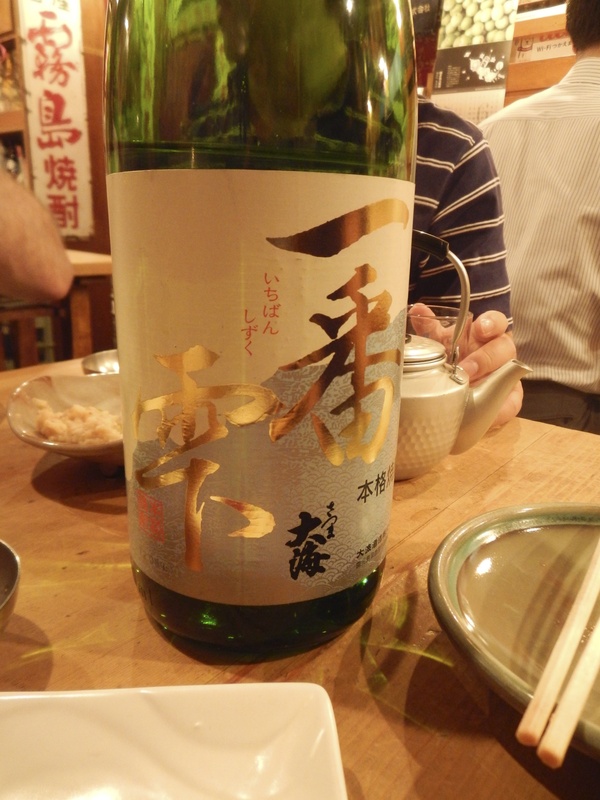 Maewari is where the shochu is watered down ahead of time, usually 24 hours or so ahead of time. It’s a great method that allows for the shōchū to mellow out and makes it much softer on the palate. I trained as a “shōchū advisor” and have studied this in class, but rarely do you come across a restaurant that actually serves it like this in Tokyo. 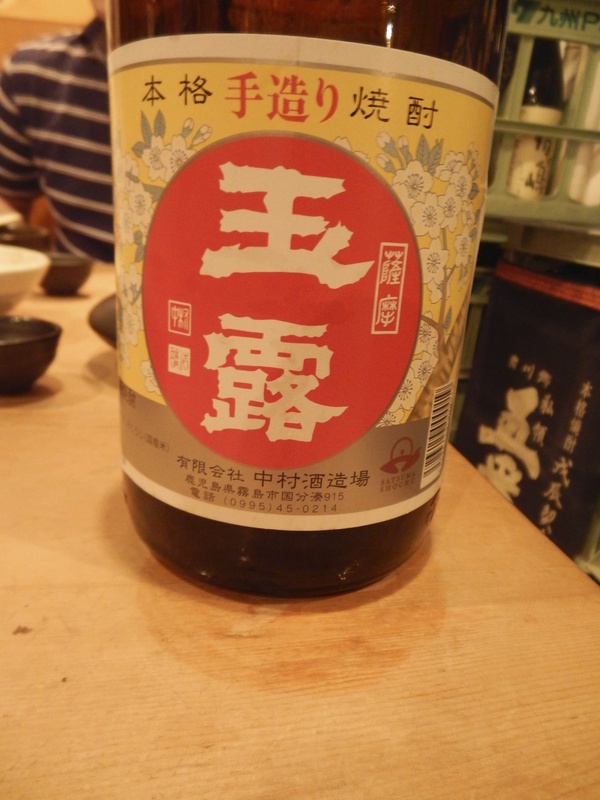 I am sure in the Kyushu region, where shochu is the prominent drink, that it is much more available. The maewari shōchū was a revelation. Much softer and gentle on the palate. I will start doing this at home. Simply add water to the shōchū to taste, usually about 6 parts water to 4 parts shōchū, but it’s up to you. Also keep in mind if you will be serving it on the rocks as it will dilute even more. The first shōchū of the evening is Ichiban Shizuku, a sweet potato shōchū (imo jōchū) from Kagoshima. It is surprisingly smooth and ever so sweet from the sweet potatoes. Even those in the party who were not big shōchū drinkers found it palatable. The magic of maewari. 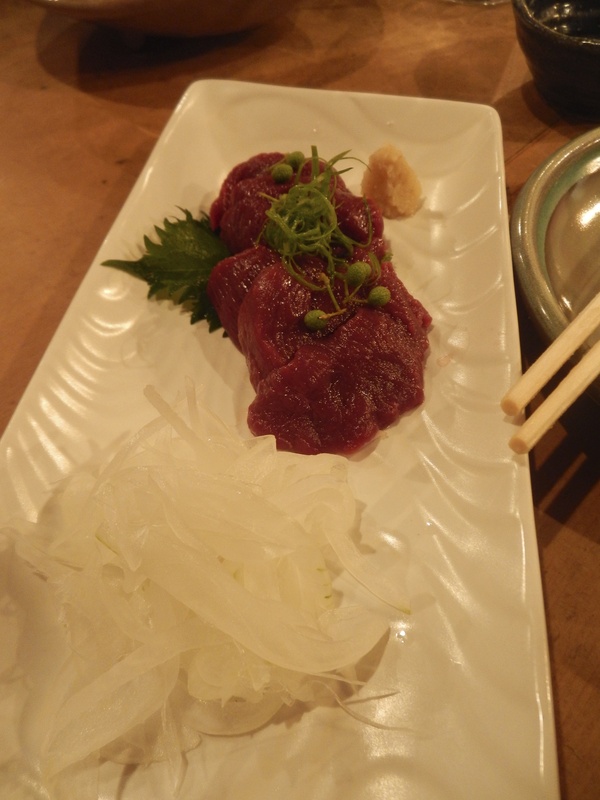 馬刺 Basic, horse sashimi, is a specialty of Kumamoto prefecture. Kumamoto is also famous for shōchū. The lean meat is meaty and chewy. It is served with some sliced onions and grated garlic. It’s garnished with fresh sanshō berries, which make your tongue tingle. Best of all, it is served with soy sauce from Kagoshima. The soy sauce in Kyushu is very sweet. Kyushu is where both Kumamoto and Kagoshima is. 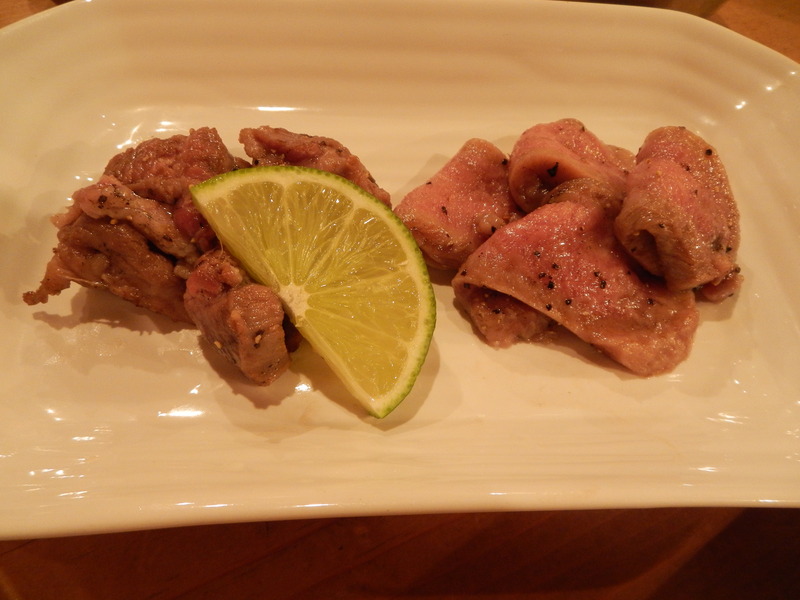 牛タン Gyutan, beef tongue, is simply seasoned with salt and pepper and grilled. On the left side is the back part of the tongue and on the right is the front of the tongue. At Bettako it is served with some kabosu (a tart citrus) that is squeezed over the meat. The back of the tongue was softer than the meaty front part. 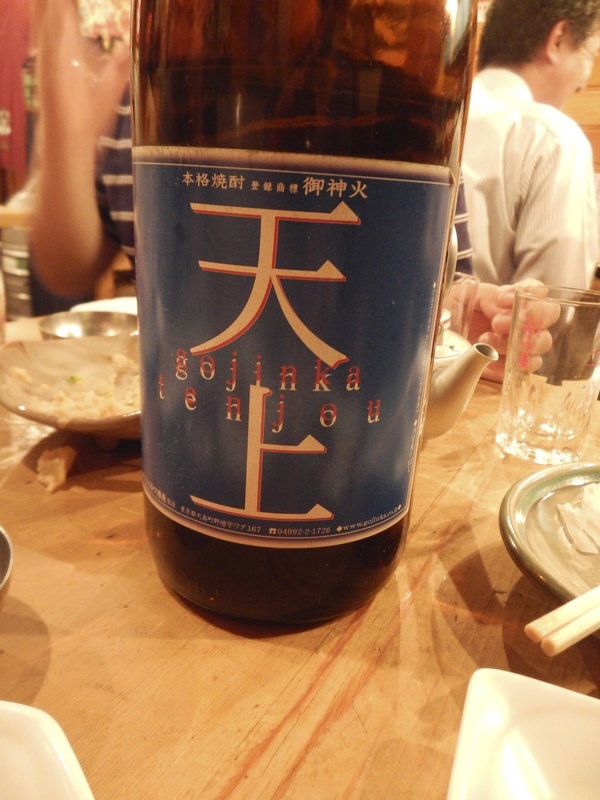 The second shochu was a barley (mugi jōchū) Gojinka Tenjo. It is from Oshima, a small island south of Tokyo, that is actually a part of Tokyo. Very different from the sweet potato shōchū, it has tones that are similar to whisky, drier and a bit more of an attack on the palate. The sashimi course today is hamachi yellowtail. It’s a great presentation as the chef serves both the back (far left) and the belly (far right). As can be expected, the belly is a bit more fattier and richer. 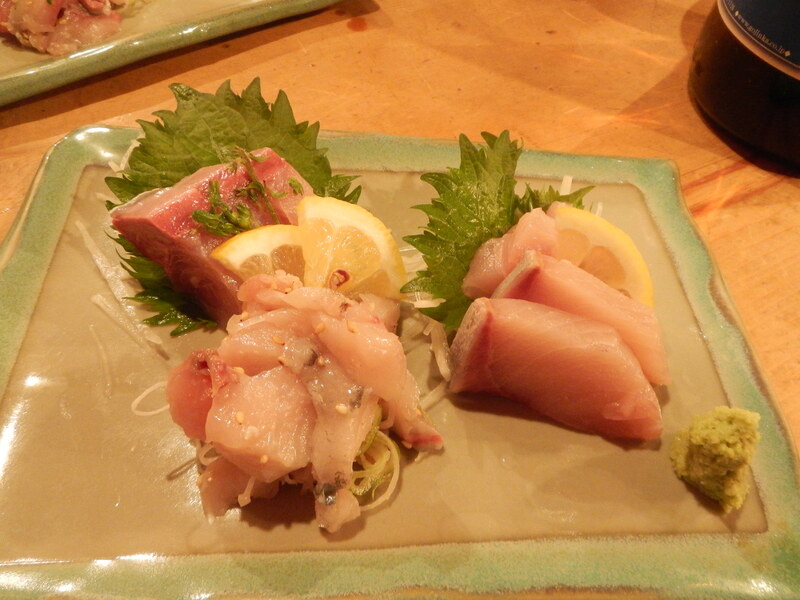 The chopped hamachi in front was simply seasoned with some sesame seeds and thinly sliced Japanese leeks. Jun Kuro (pure black) Satsuma no Kaori (aroma of sweet potatoes) shōchū was next. I really love these sweet potato shōchū. Sweet potato shōchū usually goes very well with seafood, which many izakaya dishes are made out of. The shōchū was served in a jyōka. Is this not the greatest pot you’ve ever seen for serving? A spout on both sides. 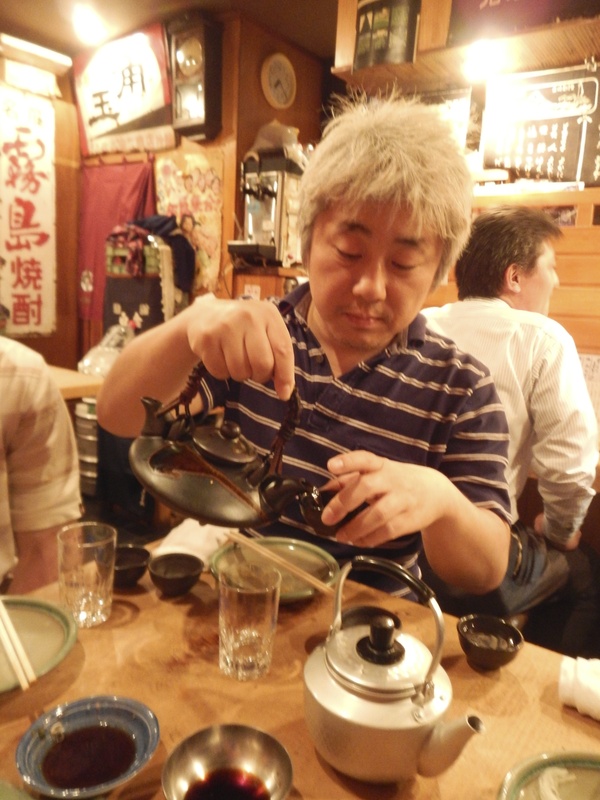 Our friend, Mizutani-san, who is a food editor and who has an amazing depth of knowledge, says that this vessel makes it easy for anyone to pour from. So, no matter which side of the table you are sitting on, you could pick up the jyōka and serve from it. You gotta love the person who thought of this design. Brilliant. 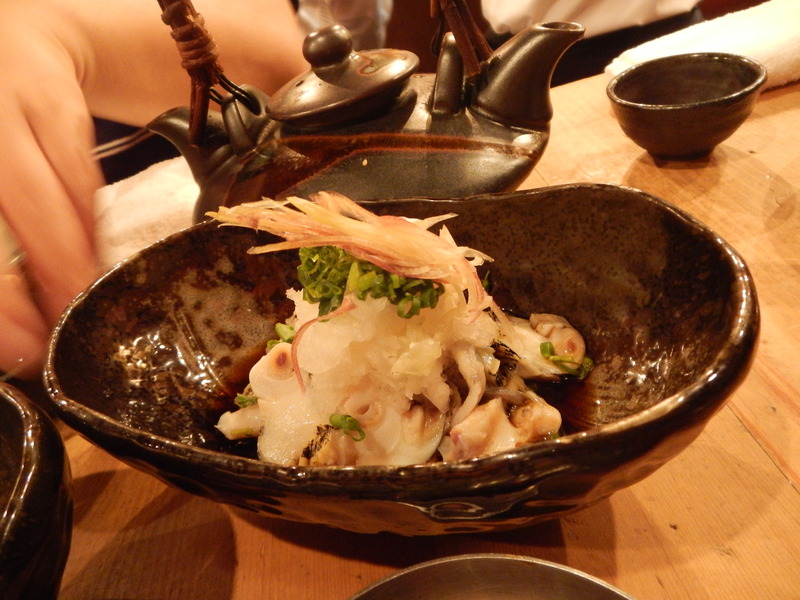 Tsubugai (whelk) is a shellfish with a rich texture. Here it is served as sashimi with some grated daikon, myōga, and green onions. One of the chefs at our table pointed this dish and said, “atarimae“. While outside of Japan, this would be a dish you may come across at a fine-dining establishment, in Japan it goest without saying, such delicious food like this would be found in an izakaya like this. The interior of the restaurant is filled with old posters. It feels a bit like stepping back in time, except for the occasional rugby poster. Interior shot. Look at how little room there is behind the counter seats to exit the restaurant. You could never get away with this in New York City. Offal soup, a perfect way to start to wrap up the evening. 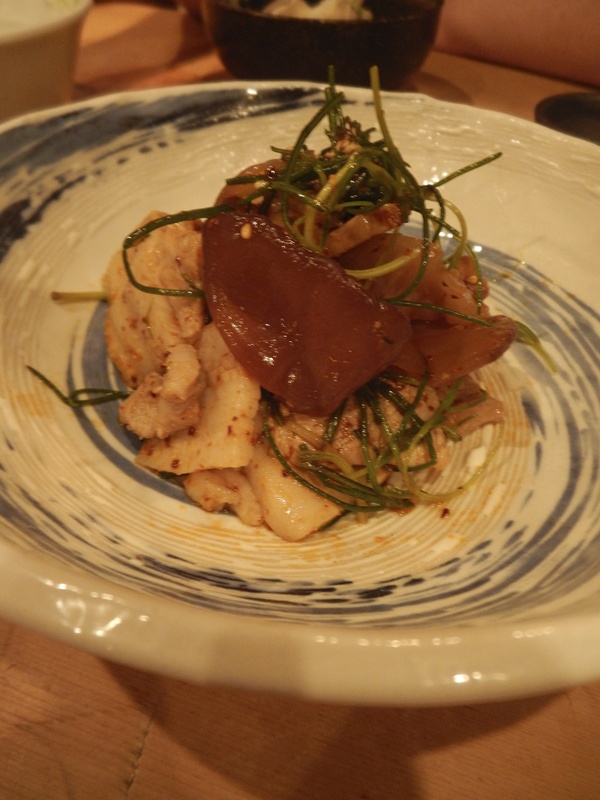 My favorite dish of the night was this pork sauteed with fresh kikuragé (wood ear) mushrooms, okahijiki – literally “hijiki of the hills” which adds a great texture, leeks, rayu chili oil and a bit of salt. Most of the time we only find dried kikuragé mushrooms in the market. The fresh kikuragé are in season at the moment. The contrast of the different textures, the bit of spiciness, and the umami from the pork brought this dish together. 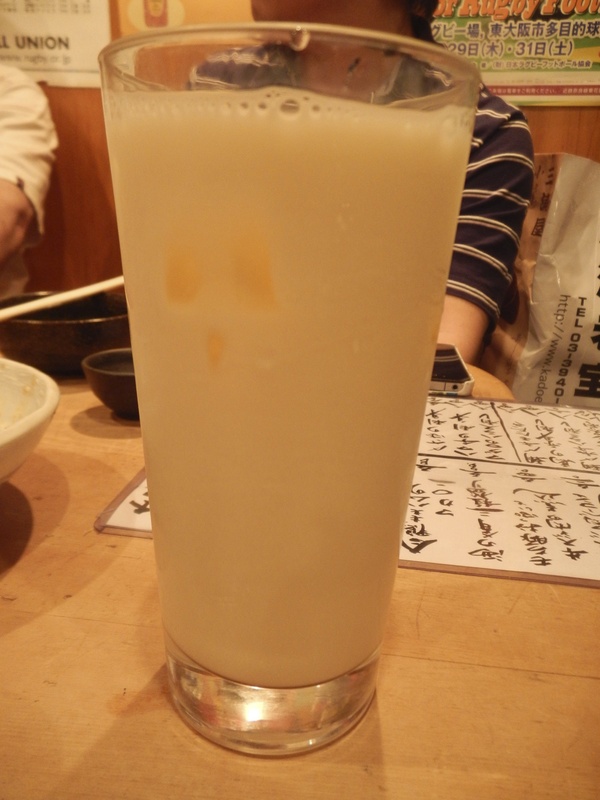 Here is shōchū with soy milk. I’ve tried this in the past and liked it when the soy milk was paired with a sesame shōchū. Tonight it was a sweet potato shōchū. Finally, Gyokurō, a sweet potato shōchū made with white kōji, which makes it a light and delicate shōchū. A great shōchū to end the evening on. Here is part of our group posing with the owner, Kanemoto-san. 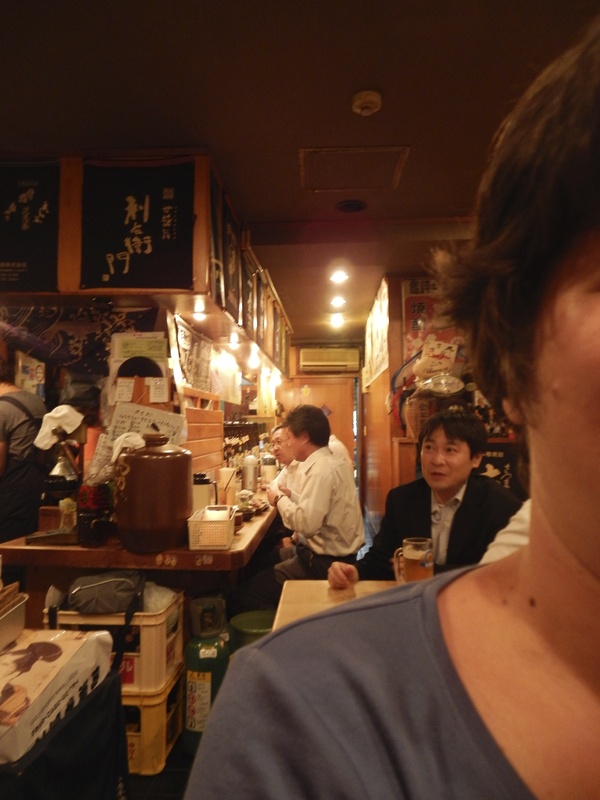 Kanemoto-san is famous in Tokyo for his selection of shōchū and for his great izakaya, Bettako. 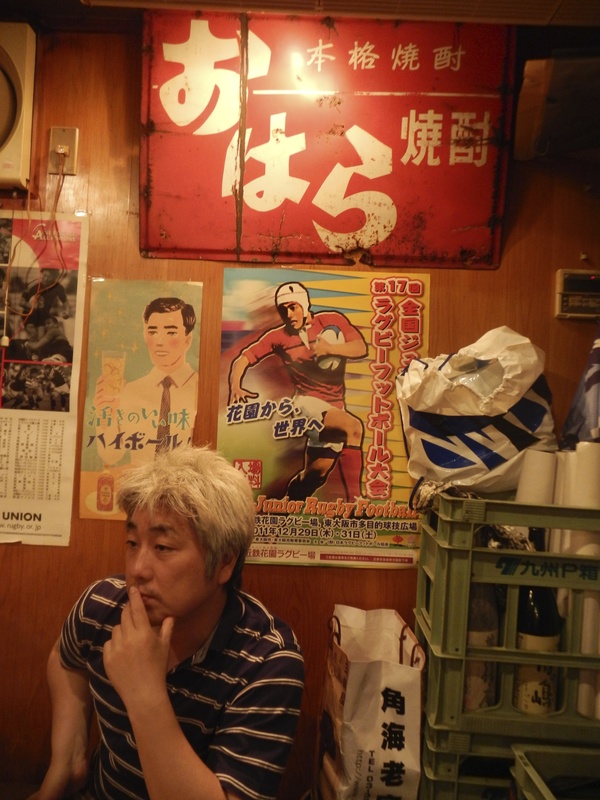 Kanemoto-san is also a big rugby fan which explains the rugby posters on the wall. The rest of our gang outside of Bettako. Bettako is a short walk from the station. It’s very popular so reservations are recommended. One way to show your support for Tohoku is to visit the antenna shops that showcase local products. Antenna shops are an excellent way to find food products and other goods from a specific region, mostly from a specific prefecture. Miyagi prefecture, one of the hardest hits from the earthquake and tsunami is known for its rich coastline that provides for seafood and other products from the sea. A popular omiyage (gift) to bring back from a visit to Miyagi is sasakamaboko. Sasakamaboko are light fish cakes in the shape of bamboo leaves (sasa). These make for a great snack with the local nihonshu. Miyagi is famous for the following seafood: katsuo, sanma, hotate (scallops), hokkigai, kaki, and awabi (abalone). One of my favorite sake breweries in Japan is Urakasumi from Miyagi. While working at Takashimaya in Nihonbashi Urakasumi’s Zen was my most recommended nihonshu to customers. You should be able to find some of Urakasumi’s nihonshu at the Miyagi antenna shop. Other products to look out for include Sanriku wakame. The shop is currently selling wakame that was harvested before the triple disaster. A variety of sweets including many types of daifuku (stuffed rice mochi balls) are also available. The eat-in counter features the local gyutan, or beef tongue. I prefer it grilled and served with white rice, or you can have it with curry.